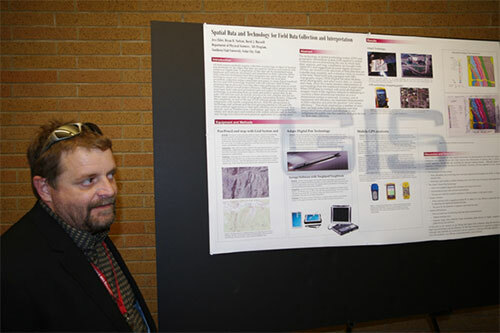 The 2012 research symposium in the College of Science and Engineering was held on Monday, November 12, 2012. This is a synopsis of the event. Therapeutic Touch (TT) was developed thirty five years ago by Dolores Kerieger, PHD, RN while a professor at New York University and Dora Kunz, a natural healer. 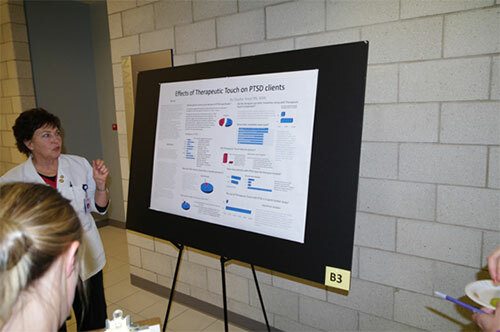 Individual holistic therapists who are members of the Therapeutic Touch International (TTIA) aka Nurse Healers Profession Associates International (NHPAI) were invited to respond to a questionnaire related to their utilizing Therapeutic Touch interventions with veterans and other clients. High school wrestling is a very popular sport, with 3125 students participating in Utah in 2011 (National Federation of State High School Associations, 2011). Each wrestler competes in a designated weight class, and must be certified to compete by state testing, which consists of measuring body fat percentage and hydration status once prior to the wrestling season. Thereafter, body composition and hydration status are not reevaluated. Many high school wrestlers engage in unsafe weight loss practices to maintain wrestling weight and this may impact body composition and hydration status. Such techniques may lead to dehydration, malnutrition, and decreased body fat percentage. This pilot study evaluated body composition, hydration status and nutritional intake of high school wrestlers at various time points during the season. Varsity wrestlers were recruited at a local high school and were tested weekly, before and after weigh-ins at selected matches, and after competition for hydration status and body composition. A Food Frequency Questionnaire was administered to wrestlers once during the season. Although the data collected were limited due to the late start of the project in the wrestling season, specific, alarming trends were observed in the wrestling population. In nearly three-fourths of all tests performed, wrestlers were found to be dehydrated. Wrestlers also showed extreme weight fluctuations of up to five and six pounds in very short timeframes. Nutritional intake of all wrestlers observed was noted to be inadequate, and in some cases wrestlers consumed less than 40% of their recommended caloric intake. 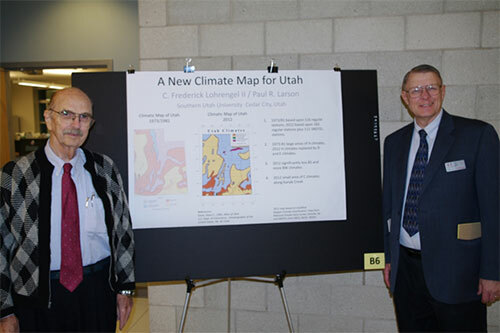 The authors have prepared a new climate map for the State of Utah using the Köppen-Geiger classification. This new map was constructed using data from the same 183 regular weather stations that were utilized for the climate map in the 1981 Atlas of Utah. In addition, data from the 111 SNOTEL stations that were installed beginning in the early 1980’s has been added. The 111 SNOTEL stations are located mostly in mountainous regions. They have increased the density of data and allowed for a much more accurate map. For example, Köppen created a category “H” (Undifferentiated Highlands) to cover mountainous regions where a paucity of data existed. The larger data-base used for this new map has eliminated the need for this category in Utah. With the addition of SNOTEL data, enhanced with satellite imagery, the areas that were formerly classified as “H” (Undifferentiated Highland) climates are now classified as “D” (Cold Temperate) and “E” (Polar) climates. Also, “BW” (Mid-latitude Arid or true desert) climates, in the Köppen classification, are more widespread in Utah, and “BS” (Mid-latitude Steppe or semi-arid) climates are less extensive than is shown on the 1981 climate map. This recently completed map offers a more realistic picture of Utah’s climates. The personal accounts of practicing nurses are missing in the research literature concerning preparation for professional practice. 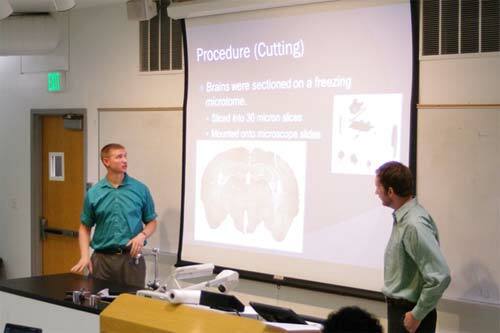 The current and projected shortage of nurses in combination with the rapidly changing health care environment underscore the need for increased research on the best nursing education practices. 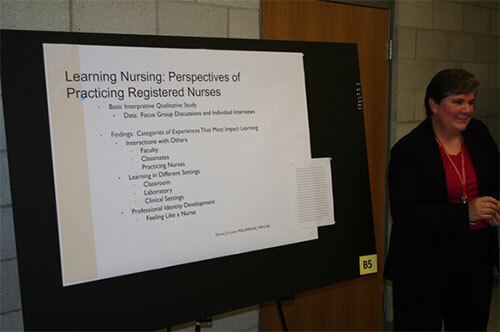 The purpose of the study was to explore perspectives of practicing nurses about learning experiences in nursing school that best prepared them for practice. The conceptual framework drew on meaning-making perspectives from constructive-developmental theorists, including Kegan, Baxter-Magolda, and King and Kitchner. In addition, conditions for learning were examined drawing largely on Gagné’s work. The participants were registered nurses from a western state who had been licensed between 6 months and 3 years. The research methodology was basic interpretive qualitative, consisting of focus group and individual interviews. Focus group discussions (20 participants) and individual interviews (6 participants) were conducted to explore nurses’ perspectives concerning educational experiences that prepared them for nursing practice. The data analysis strategy was to identify themes. Like themes were combined to produce categories. 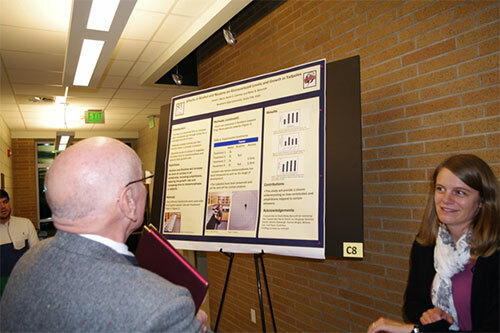 The major findings of the study were that interactions with others, mainly faculty members, and the learning environments have significant impact on learning experiences for nursing students. 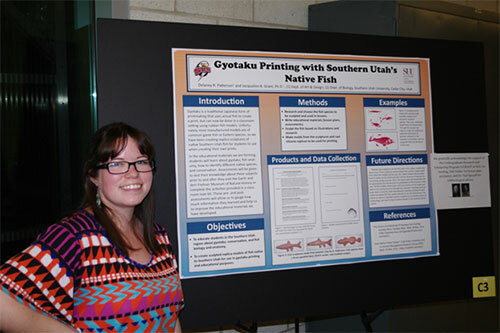 This presentation will discuss the gyotaku printmaking process, fish species native to Southern Utah, and the educational materials we are currently developing that intertwine the two. Gyotaku is a traditional Japanese form of printmaking that uses actual fish to create a print, but can now be done in a classroom setting using rubber fish models. The problem with this is the lack of diversity in fish species available for making gyotaku prints. They are mostly common game fish or Eastern species, so we have been creating replica sculptures of native Southern Utah fish for students to use when creating their own prints. 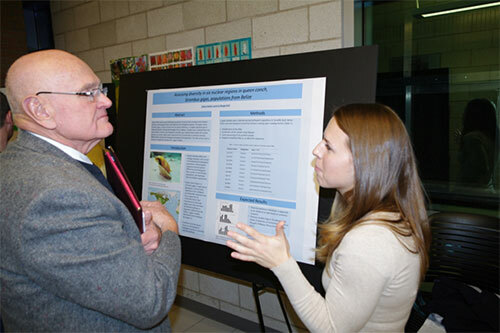 This will allow students to become familiar with the different local species as well as fish anatomy and the unique printmaking process. In the lessons and activities we are forming, students will learn about gyotaku, fish anatomy, how to identify different native fish species, and conservation. Every student will be given assessments to test their knowledge about these subjects prior to and after they visit the Garth and Jerri Frehner Museum of Natural History or complete the activities provided in a classroom loan kit. These pre- and post- assessments will allow us to gauge how much information they learned and help us to improve the educational materials we have developed. 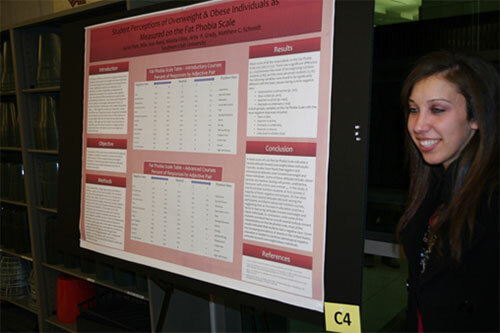 fat phobia, but very few have focused on college nutrition students and their attitudes toward obese and overweight individuals. 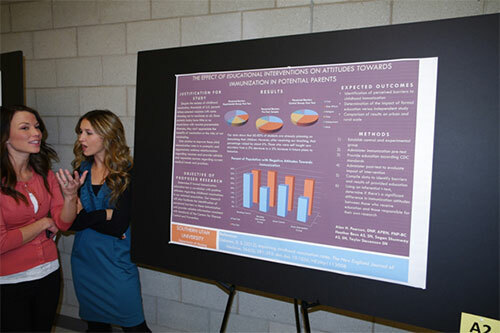 The purpose of this study was to determine if the perceptions of nutrition students improved with the level of nutrition education. 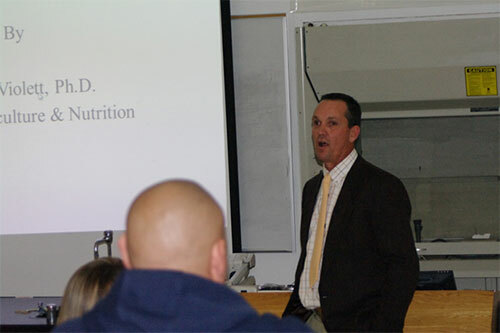 Three hundred fifty college-age subjects enrolled in nutrition courses at Southern Utah University (SUU) were studied. Two hundred forty-five of the participants were in an introductory course and 105 were in courses above the introductory level. Participants were surveyed using a modified version of the Fat Phobia Scale. A mean score of three on the scale indicates a neutral attitude towards obese/overweight individuals. 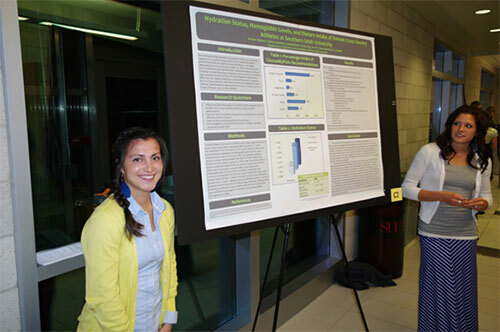 The mean score of beginning nutrition students was 3.89 and the more advanced students was 3.76, indicating that nutrition students enrolled in nutrition courses at SUU do possess a majority of these negative stereotypes. The following variables on the fat phobia scale were found to be significantly different, with the basic classes having a more negative view: unattractive vs. attractive, slow vs. fast, inactive vs. active, and overeats vs. undereats, suggesting that an increase in education could be a factor in improving attitudes toward obese and overweight individuals. Glossiphoniids are jawless leeches that feed using a proboscis, which they use to impale prey so that they can feed on their prey's blood and tissues. This study focuses on two different genera, Glossiphonia and Helobdella. Helobdella feed on a variety of prey, including bloodworms and freshwater snails, often feeding together in large groups. When a prey item is placed in the container, Helobdella immediately begin smelling the water and moving toward the prey. After the first Helobdella makes contact and secures prey, other individuals within the group will move to that area, often passing prey along the way, to attach to the same prey item. Once a number of individuals have started feeding, the prey is often broken into smaller pieces and individuals can then begin feeding on various sized pieces. This is in contrast to members of the genus Glossiphonia, who appear to be selective with their prey, and have been observed going up to 4 weeks without feeding, even in the presence of their non-preferred prey (bloodworms). When preferred prey (freshwater snails) were placed in the container, unfed Glossiphonia did not immediately begin smelling the water or initiate hunting. Unlike Helobdella which feed in groups, Glossiphonia appear to prefer feeding alone, and have even exhibited competitive behaviors. Nuclear DNA can be used to delineate population structure that can assess and compare diversity and biological fitness of threatened and endangered species. The queen conch, Strombus gigas, a marine animal from the phylum Mollusca, is a highly exploited species whose livelihood is threatened throughout the Caribbean. Samples were collected from the coast of Belize. Primers were designed to amplify open reading frames within the nuclear genome. Six nuclear regions were sequenced from 20 individuals to estimate diversity, differentiation and percent divergence throughout the population. This data can be used to enhance management practices for S. gigas in Belize. Glucocorticoids are a family of hormones that are released after vertebrates go through stress for a prolonged period of time. High and prolonged levels of glucocorticoids in the blood may have negative effects on vertebrates such as hyperglycemia, hypertension, lowered immunity response, and higher levels of LDL cholesterol. Unfortunately, most research has taken place in humans. The hypothalamus of tadpoles signals the release of glucocorticoids, just like in humans. 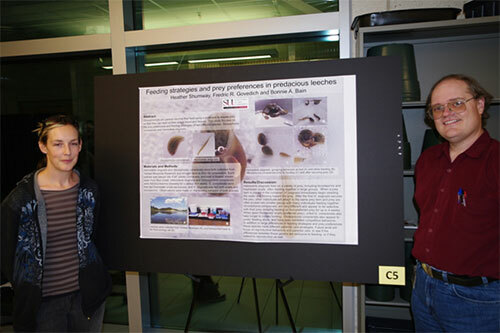 We used a controlled experiment to measure the effect of stressors before amphibians have gone through metamorphosis. We used 10 tanks per treatment. One treatment was the control group with de-chlorinated water. For the second treatment we added 1.5 mL 80% ethanol. For the third treatment we added 4.0 μL nicotine. For the fourth treatment, we added 1.5 mL 80% ethanol and 4.0 μL nicotine. We used analysis of variance (ANOVA) to compare growth, survival, and development rate among the treatments. 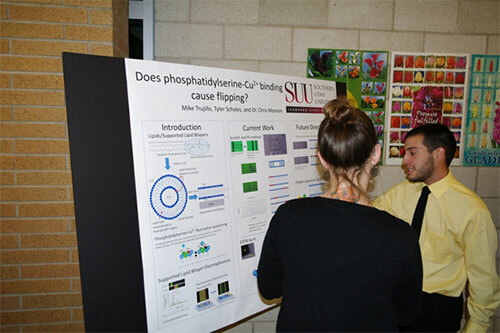 Does phosphatidylserine-Cu2+ binding cause flipping? Lipids are essential building blocks for cell membranes. Phosphatidylserine (PS) is a type of lipid that is regulated more strictly than most other lipids, with PS residing on the inner leaflet of cell membranes. Previous experiments have suggested but not demonstrated that when Cu2+ binds PS the complex can “flip” between leaflets of a bilayer. 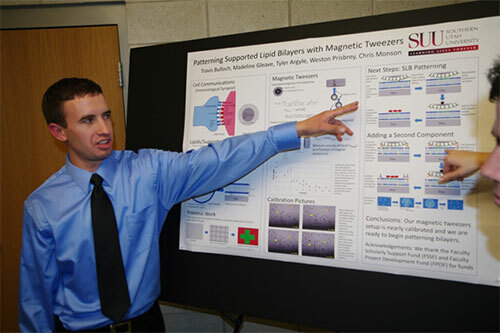 We are testing this hypothesis using supported lipid bilayer techniques, specifically in combination with electrophoresis and microfluidics. Our data, while not yet conclusive, supports the flipping hypothesis. As humans, we have the ability to change our diets if we are deficient in any specific nutrient. Many animals have the ability to change their diet if they are deficient in nutrients. However, for many carnivores, it is generally thought that a prey item will have the same nutritional composition as the predator body composition. Carnivores are limited nutritionally in their diet. This means that they only get nutrients from the prey that they are able to locate to consume. This study is investigating prey choice of invertebrate predators (wolf spiders) when their prey item has been altered to be deficient in one specific nutrient (lipid or protein). 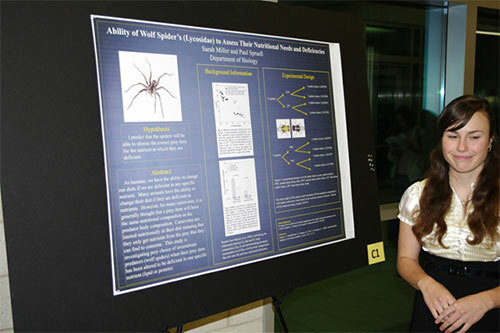 I predict that the spiders will be able to choose the correct prey item for the nutrient in which they are deficient. In recent years, an increasing number of parents have chosen to not vaccinate their children following a decreased exposure to preventable childhood illness (such as pertussis, diphtheria, mumps, rubella, etc.) and questionable media influences. A recent outbreak of Pertussis in Parowan, Utah, alerted us to the fact that interventions regarding childhood immunizations are indicated to prevent further epidemics. Due to the defined scope of nursing practice, this problem pertains to us as nurses in educational interventions and the actual delivery of vaccinations. This study is needed to identify whether educational interventions presenting valid scientific-based information will influence the attitudes of potential parents regarding childhood immunizations. Immunizations have been an accepted aspect of childhood for the last few decades. However newer scientific evidence, often of questionable validity and popular media has influenced parental decisions on whether or not their children receive these immunizations. Due to the recent outbreak of pertussis in Parowan, Utah we felt it appropriate to research education in relation to immunizations and how that education influences parents’ choices in deciding whether or not their children receive immunizations. It has also been questioned whether or not the location has an influence on attitudes toward childhood vaccinations, and subsequently are including potential parents from both urban (St. George, Utah) and rural (Blanding, Utah) settings in our study sample. We decided to limit our population to high school seniors because we believe that their decision is less influenced by previous experience and based more upon popular trends and media. 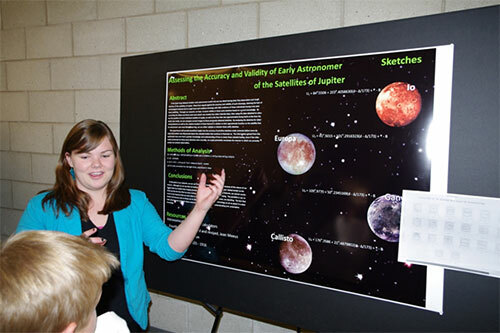 Assessing the accuracy and validity of early astronomer sketches of the satellites of Jupiter. It has been long debated whether early astronomers could truly see any detail during their first observation and rough sketches of the satellites of Jupiter. Many have argued against the accuracy and validity of such drawings, claiming the lack of technological advance led to rough hewn and mediocre drawings with little evidence of these individuals having truly seen these satellites. Through our research, we hope to prove validity in those early sketches based on current knowledge. By converting the dates and times each early sketch was created into Julian Calendar days, then using the date obtained to calculate the position of each individual satellite of Jupiter, as well as the face that was approximately facing Earth at the time the sketch was made, we can compare current images to those previously obtained sketches. By analyzing the sketches for determining features as well as the relative location of those features in relation to their approximate location on the satellite face the astronomer was most likely observing, we can either validate or disclaim these early sketches. This experiment will provide beneficial insight into the accuracy of primitive sketches made centuries before more detailed information was discovered about the celestial bodies that continue to fascinate us. The information gained from this experiment may even lend a greater knowledge and understanding of how to study these celestial bodies, since if the information presented by these early sketches were accurate, we could potentially reevaluate the manner in which we currently conduct our present observation. The arrangement of components within cell membranes can be extremely important, particularly in cell communications. For example, in an immunological synapse proteins are arranged in a bull’s-eye pattern, with specific proteins in the inner and outer regions of the bull’s-eye. The ability to generate such patterns in bilayers could see applications in many areas of biology. Our goal is to take an initially unpatterned supported lipid bilayer (model cell membrane) and use magnetic tweezers to generate patterns. Our initial work has focused on calibrating the magnetic tweezers device, and we are beginning to move on to pattern generation. Taricha granulosa, a species of newt, excretes Tetrodotoxin (TTX), a neurotoxin, from their skin. 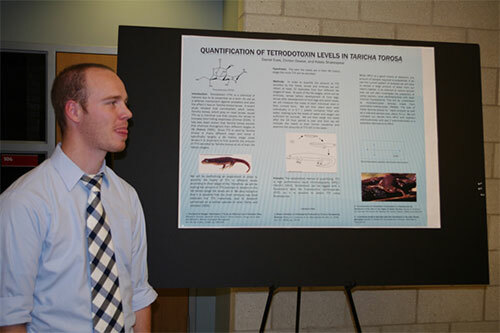 Tetrodotoxin is used by the newts as a means of protection from predators. It has been shown that adult, larvae and embryos of Taricha torosa contain TTX. We would like to quantify the amount of TTX excreted from the newts at their different stages of life, including embryos, larvae (pre and post hind leg emergence) and adult newts. We will employ both high-performance liquid chromatography (HPLC) (the established method of quantification) as well as capillary zone electrophoresis on a microchip to determine the concentrations of TTX. Resource availability can fluctuate in both space and time. This patchy distribution of resources can act as an environmental stressor, resulting in acclimation within organisms. Like other resources, food availability can be variable over time and space, and the lack of food availability can be stressful for organisms. Symbiotic organisms such as some cnidarians receive nutrients both from their symbiotic dinoflagellates and through prey capture using specialized cells called nematocysts. Symbiotic cnidarians can supplement heterotrophic feeding with photosynthate from their dinoflagellate symbionts. Thus, some cnidarians can persist in relatively low food environments with extremely variable prey availability. We tested the effects of feeding frequency on nematocyst production in Aiptasia pallida, a sea anemone. We hypothesized that A. pallida would up-regulate production of nematocysts when starved as a secondary mechanism for surviving low food availability. Five tanks of A. pallida were fed twice a week (well-fed) and another five were fed once a month (starved). We quantified nematocyst production by crushing A. pallida tentacles and counting the number of nematocysts in a known volume of solution using a hemocytometer. We found no difference in nematocyst production between our two treatments. However, the starved group was highly variable in nematocyst number. Our study helps clarify how some organisms may cope with fluctuating resources, such as food availability. 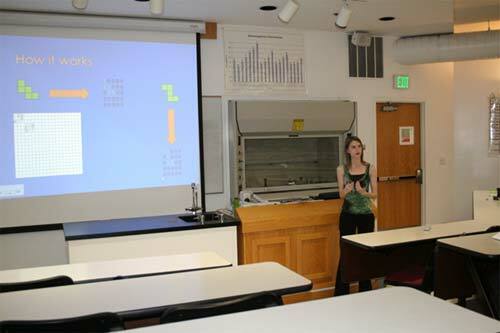 Mentor(s): Laurie A. Mauger, Ph.D.
Sequences of mitochondrial genes are useful in studying phylogeography and genetic differentiation in populations of threatened and endangered species. We will determine the genetic structure of the American Crocodile (Crocodylus acutus) populations along the Pacific coast of Costa Rica with the mitochondrial regions tRNAPro - tRNAPhe of the D-loop, the cytochrome oxidase gene, and the entire cyt b gene using the primer pairs drL15459 and CR2HA, COIa and COIf, L14211, CB3H, L14849, and H15453 respectively. Crocodile samples were collected from 11 localities along the Pacific coast of Costa Rica. We will construct neighbor-joining (NJ) and maximum likelihood (ML) trees for the mitochondrial regions. We will estimate the mitochondrial divergence across geographical locations for crocodiles in pacific Costa Rica. Preliminary data support minimal divergence and independent evolution in the sampled populations. Research has shown that there is a possible link between casein consumption and cancerous lesion growth in rats. Casein, a protein found in cow milk, has historically been seen as a healthy component in the human diet, but could in fact be a driver of cancer. 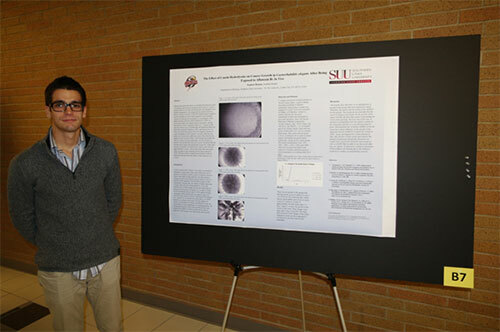 Our SUU-UGRASP funded research sought to test this hypothesis on the model organism Caenorhabditis elegans by exposing the nematodes to a carcinogenic molecule called Aflatoxin B1. AFB1 is a mycotoxin found in the fungus species Aspergillus, and has been known to have a genotoxic effect on C. elegans .We grew the worms on an LB broth plate and transferred them into wells that contained S-Medium, AFB1 and Escherichia coli. 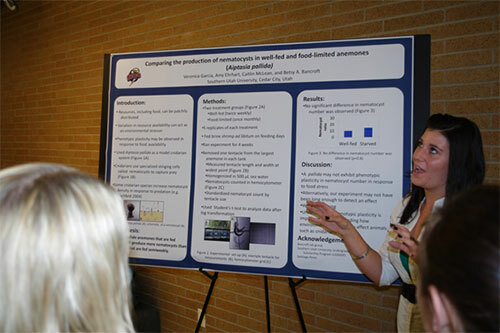 Three out of the four groups were given specific amounts of casein in addition to their normal E. coli diet, while the last group was not given any additional casein. After allowing the groups to grow for up to 9 days, while being swayed back and forth on a rocker at room temperature, we saw virtually no growth in the groups that were given casein. The group that had not been given casein showed growth of up to 50+ worms after two days of growth. The initial worm count in each well was approximately 5 worms. These results show that casein does make an impact in the nematode growth when exposed to AFB1. However, further research must be done in order to determine what the molecular effects of the casein are in C. elegans. The technology of global positioning system (GPS) and geographic information system (GIS) applied to mobile computers are revolutionizing the way in which field data, analysis, and map compilation are brought forth. Tablet PCs and ruggedized personal digital assistants (PDAs) can record a wide spectrum of field data that can expedite map assembly and evaluation while on location in the field. Hand held units equipped with DRG (topography maps), DEM (Digital Elevation Models), aerial photography, and select vector data, i.e. streams and roads, allow for a more intuitive interpretation of surroundings than the traditional format of paper maps. When DEM data is overlaid with aerial photographic imagery much of the cognitive obstacle of attempting to visualize a three dimensional interface on a two dimensional surface is removed. Accuracy, cost of equipment and efficiency are important characteristics in field collection and pose the question “cost versus efficiency.” This study emphasizes a number of ways that can help make field data collection and map preparation more efficient and effectual. It also enlightens the public into the usability of digital devices for to field data collection. Studies indicate that proper hydration and nutrition are vital to athletic performance. Athletes benefit from adequate iron intake, which may result in increased aerobic capacity. The purpose of this study was to examine athlete hydration status, hemoglobin levels, and caloric intake. Twenty female cross-country athletes with a mean age of 20.3 years and a mean Body Mass Index (BMI) of 19.6 were recruited from the Southern Utah University Women’s Cross Country team. Urine specific gravity (USG) was analyzed pre, post, and six hours after two separate training sessions. The perceived exertion (PE) of individual athletes was measured post workout using the OMNI PE scale. The mean USG results for the athletes’ pre and post workouts both showed minimal dehydration. Six hours post workout subjects were significantly dehydrated. There was no correlation found between USG and PE. Hemoglobin levels were measured at a later date. Results indicate that the athlete’s levels were within normal limits. Athletes also completed a food/beverage intake log over a period of seven days. During this time athletes took in an average of 98% of calculated caloric intake needs. Looking at the ChooseMyPlate recommendations, Meat/Bean, Vegetable, and Fruit intake percentages were far below recommended amounts. Data suggests that this population would benefit from education on intake of nutrient dense foods and proper hydration. 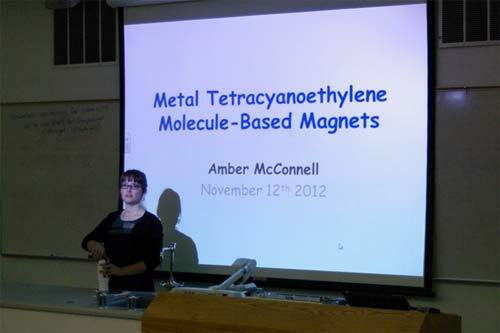 Two compounds in the metal-tetracyanoethylene (TCNE) family of molecule-based magnets will be presented. The first compound, MnII(TCNE)3/2(I3)1/2, is the first known structure of a molecule based magnet to possess μ4-[TCNE]•- in all three dimensions. The presence of the reduced form of TCNE ligand helps facilitate direct exchange interaction since it can act like a spin-bearing metal. MnII(TCNE)3/2(I3)1/2 was also shown to exhibit a pressure-induced reversible enhancement of the critical temperature up to a maximum of 273 K. The second compound, MnII(TCNE)[C4(CN)8]1/2, is similar to the first, yet has dramatically different magnetic behavior. This compound magnetically orders as an antiferromagnet with a critical temperature of 67 K. This compound exhibits a reversible ferri- or ferromagnetic pressure-induced magnetic transition. When an area is developed no part of that habitat is left unaffected. Urbanization creates many problems for animals by creating physical barriers, fragmenting habitat, introducing completely new habitat, and introducing species. Exotic species are often better competitors for resources and often competitively exclude native species, resulting in population declines and ecosystem disruption. Despite the negative effects of urbanization some species are able to adapt and survive in urban ecosystems. One such species is the wandering garter snake (Thamnophis elegans vagrans). This species is described as a generalist in habitat selection and is often seen in urban communities basking on sidewalks and pavement, living in gardens, and feeding on rodents, insects, and other species. One unique characteristic of this genus is that prey preference has been observed as being a genetic trait and possesses variation, and as such can be modified via natural selection. 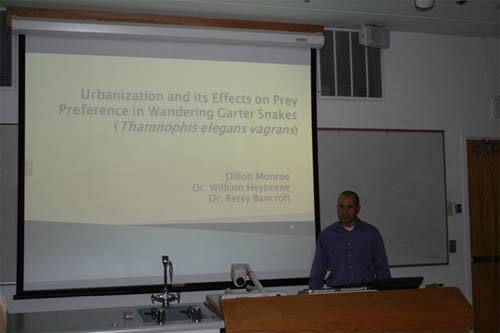 For my research project I looked at whether prey preference of T. elegans vagrans differs between snakes from three different locations with varying levels of human development. From these three locations in Utah, Tropic reservoir, Monroe (Sevier River), and Utah Lake, we obtained a total of 14 snakes and found that in this group of snakes there is no correlation of prey preference in snakes to level of development of the habitat. The k-characters of a finite group G were defined by Frobenius in 1896. The 1-characters of G are the well known irreducible characters of G and correspond to representations of the group algebra of G. The 1-S-ring is the center of the group algebra and determines the 1-characters. 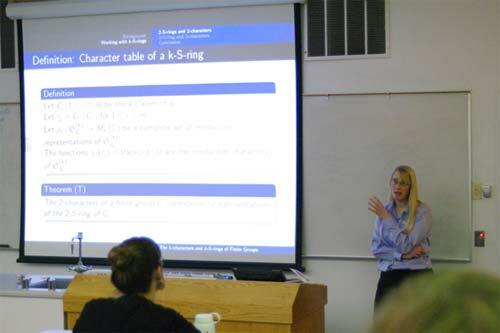 The k-S-rings, for k>1, are a generalization of the 1-S-ring, motivated by the definitions of the k-characters of G. I will present some of my research on k-S-rings, including results on the character theory of the 2-S-ring of G and its relationship to the 2-characters of G.
Membranes are crucial for life on earth, and membrane proteins in particular perform many essential functions. Techniques under development at other universities offer, in many ways for the first time, the opportunity to purify membrane proteins in their native conformations. However, in order to fully take advantage of these purified membrane proteins, the membrane proteins would ideally be in vesicles. There are currently no techniques that can convert supported lipid bilayers to vesicles in the literature. We have developed a technique using high flow in a microfluidic device that can strip supported lipid bilayers. We will discuss our progress towards creating a device capable of selectively stripping portions of supported lipid bilayers and repackaging them into vesicles. 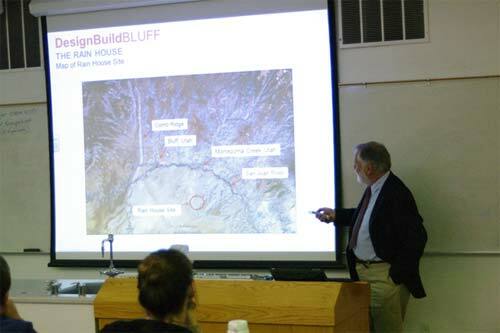 DesignBuildBLUFF (DBB) is a non-profit organization including architecture and engineering students from the University of Utah, University of Colorado, Denver, Southern Utah University, and other individuals whose mission is to design and build architecturally innovative, pro bono, sustainable homes for Navajo families living on the reservation near Bluff, Utah. This unique, hands-on, two-semester design/build program creates hope for the Navajo families, builds bridges between cultures, connects theory & practice for students, reunites the arts and the sciences, and develops character. 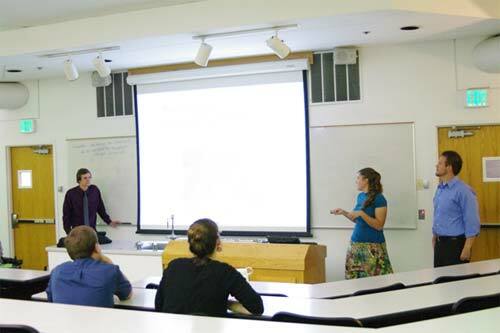 SUU faculty and students have been involved with the program since 2009. 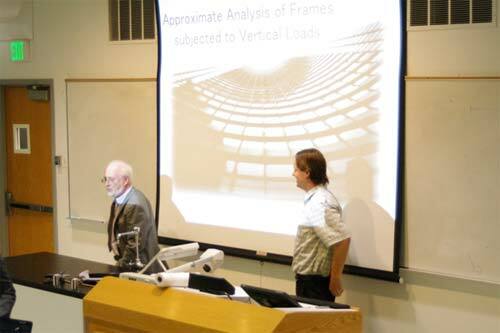 In June of 2012, two SUU engineering students, Chris Hoffman and Mark Tervort traveled to Denver with engineering professor John Murray to work with twenty graduate students and professor Rick Sommerfeld in the College of Architecture and Planning at the University of Colorado to design a passive solar home for Lorraine Toney, a Navajo mother of five. During the design phase of the project, a cooperative relationship was established with the National Renewable Energy Laboratory in Golden, Colorado which allowed the DesignBuildBLUFF team to model and simulate the home’s energy usage over time. Energy usage was an important design consideration since buildings use 48% of the total energy consumed in the United States. Construction of the home, located twenty-five miles southeast of Bluff, began in August. Completion is anticipated in December. 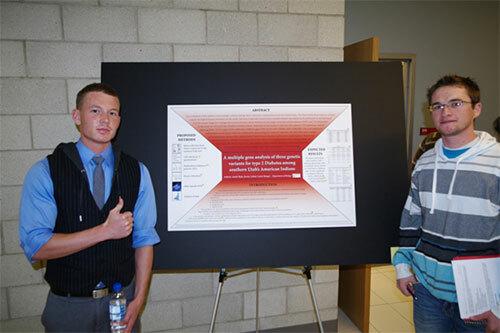 COSE generously provided partial financial support for students participating in this year’s DesignBuildBLUFF project. Rabbitbrush (Chrysothamnus spp.) is a genus of native shrubs that are common in many plant communities throughout the western United States. The genus Chrysothamnus contains 16 species and 41 subspecies. All species of rabbitbrush are very prolific seed producers and can be extremely invasive, particularly in disturbed areas such as abandoned homesteads or in rangeland seedings. Management of rabbitbrush is difficult because it is deep rooted and sprouts vigorously after a disturbance such as fire or mechanical treatments. Many treatments and combinations of treatments have been tried with little success or with highly variable results. Effective practical treatments have so far eluded range managers or landowners. Multiple treatments combining fire, mechanical removal and herbicides in various combinations, have shown promise for control. Since 2005, the authors have used a multiple treatment mower that after mowing, windrows the woody debris, then wipes herbicide on the cut stubble to treat Rubber Rabbitbrush (Chrysothamnus nauseosa). Treatments applied in the fall have provided excellent results with Tordon (picloram) and Vanquish (dicamba) at rates as low as one quart per acre. Separate plots with foliar applied herbicides, indicate a new herbicide, Streamline (MAT 28 + metsulfuron), initially appears to show promise in control of Rubber Rabbitbrush. Parkinson’s disease (PD) is a neurodegenerative disease that results in muscle rigidity, tremors, difficulty walking, and so on. The majority of cases occur in people over the age of 50, increasing in probability with age. What has been found to be the underlying cause of PD is progressive cell death in the subtantia nigra. This area of the brain helps control muscle movement, which is why PD is associated with muscle tremors. The neurons under study release dopamine which in turn controls movement. As the cells die, less and less dopamine is created, eventually leading to severe PD. Studies have been conducted into possible environmental factors contributing to PD. One such study investigated the herbicide Paraquat. In this study the effect the chemical had on mice brains was tested to see if dopaminergic neurons were affected in the substantia nigra. This study found that the herbicide lead to neuronal cell loss and damage. Using this study as a foundation, we decided to test the effects of fire retardant on mice to see if there was a similar result. If this hypothesis is supported, this may have a large impact on the type of forest fire fighting techniques currently being used. Many people have been exposed to some degree of the retardant if they have lived anywhere near a forest fire. This includes people in the Cedar City area. We used the Lagrange multiplier method to study the behavior of a firm under the regulation constraint from the government. We studied the relationship between the investment and labor cost of a firm to determine the effects that a government constraint can have on a firm. This is an optimization problem. Using the Lagrange multiplier method and numerical analysis, we were able to determine the direct effects that the government constraint can have on a firm’s ability to make a profit. 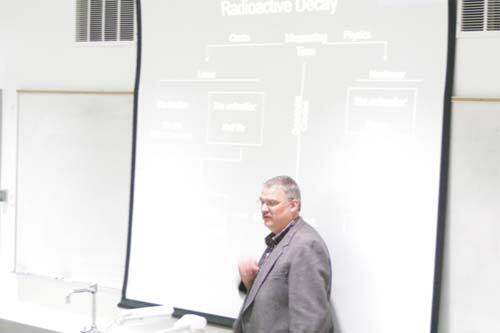 An understanding of Atomic Half-Life is necessary in order to understand Radiometric Age Dating. 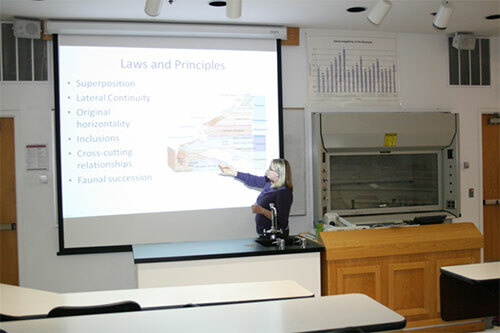 Radiometric Age Dating is a principle taught in a broad spectrum of science and science-related courses. Numerous demonstrations of the principle of Atomic Half-Life have been developed. However, they do not demonstrate the reality that each half-life occupies the same interval of time no matter where the event occurs between 100% parent and 100% daughter product. Nor do the other demonstrations show the variable rate of decay of individual radiogenic decay events as this one does. We present a new demonstration that helps participants grasp the constancy of half-life duration of radiogenic materials as well as gain a feeling for varying rates of decay. Monitoring student progress in a class can be extremely challenging. 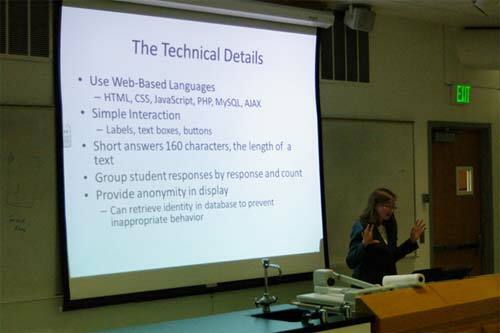 This presentation describes a new, web-based system for collecting and displaying student responses to teacher generated questions with the ability to display student answers as well as how many students answered a particular way. The presentation also describes why this is a work in progress and current directions of work. Scotch Thistle (Onopordum acanthium), Musk Thistle (Carduuas nutans) and Bull Thistle (Cirsium vulgare) are invasive species that produce large quantities of seeds that remain viable for long periods of time. Collections were made of the species from various locations. Five distinct stages of growth were determined. Samples were collected and labeled with the maturity stage of each seed pod recorded. 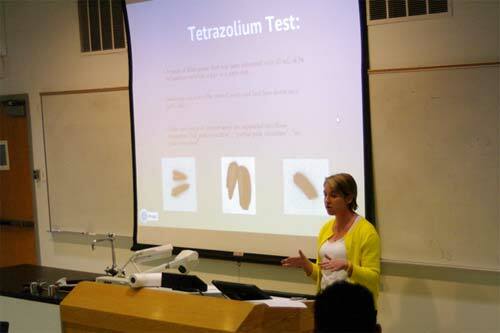 Tetrazolium, cut, and pop tests will be used to help indicate seed viability. I hypothesize that different stages of maturity will have varying degrees of viability as determined by tests. Furthermore I predict later stages will have the most overall viability and the pop test will positively correlate with the tetrazolium and cut tests. 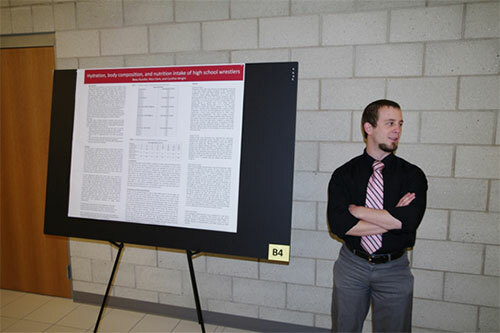 The results are in progress but will be ready to present at the November 12th symposium. 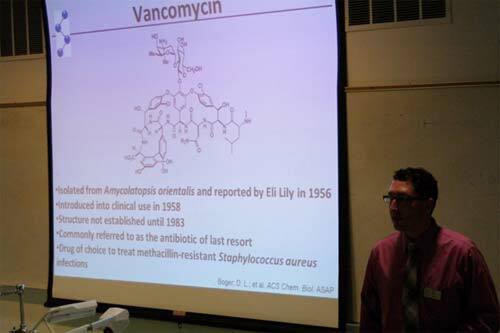 Author’s Name(s): Nathan S. Werner, Ph.D.
Vancomycin is the most widely recognized member of an important family of glycopeptide antibiotics and referred to commonly as the antibiotic of last resort. Its most important clinical use is in the treatment of methicillin-resistant Staphylococcus aureus infections which are becoming unsettlingly common in hospital intensive care units and the community. However, the emergence of vancomycin-resistant (VR) strains of virulent bacteria poses a major health problem and has stimulated efforts to develop vancomycin analogues to combat these deadly infections. To increase the potency of vancomycin toward VR strains of bacteria a diglycoside was synthesized for attachment to vancomycin. A novel p-chlorobiphenylvancosamine unit was prepared through the development of an unprecedented glycosylation reaction. Moreover, reaction conditions for selective attachment of the diglycoside to vancomycin were discovered. The approximate method of analysis of vertical loads on building frames in the literature seems to contain a serious error. 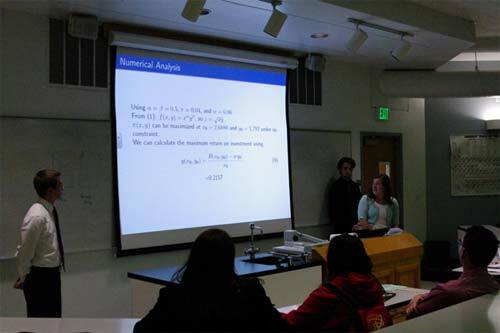 In this presentation, the nature of this error is explored. 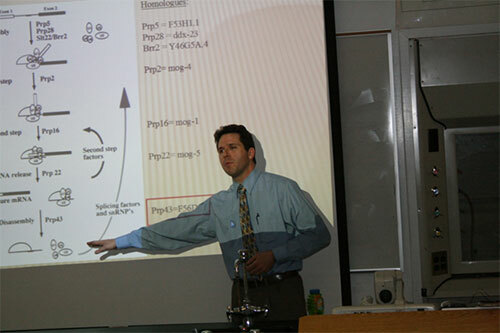 A corrected method is presented. These results are checked using Visual Analysis, a standard structural finite-element analysis package. Blokus® is a board game involving twenty-one distinct shapes. These shapes are then placed on a twenty-by-twenty grid in such a way that only the corners of like colors touch. The main goal is to place all twenty-one of your pieces on the board while also preventing the other three players from doing the same. The goal of this research was to determine if it is possible to place all of the pieces on the board, while following the game rules. To do this, a Java code was constructed that will run simulations of the game until all solutions are found. Then, non-isomorphic solutions will be identified. Sure, they’re cool, but why do fossils matter? It has been said that paleontology is not a “real science” and provides nothing useful to today’s society. Why should we care about these creatures that are no longer around? What relevance do they hold? There are several reasons why we should care about these fossils and why we should continue paleontological research. For example, fossils are the characters in the story of our geologic past. Deciphering relationships between organisms help to fill in the branches of the tree of life, leading to a better understanding of evolution. Fossils are a major component of past ecosystems and provide crucial data when reconstructing ancient climates. Paleontologists can also use the extinctions and radiations that are attributed to climate change to gain a better understanding of what we might expect if current climate continues to warm. Therefore, the scientific data that we can glean from paleontology does matter and can be an integral part of a variety of research areas. 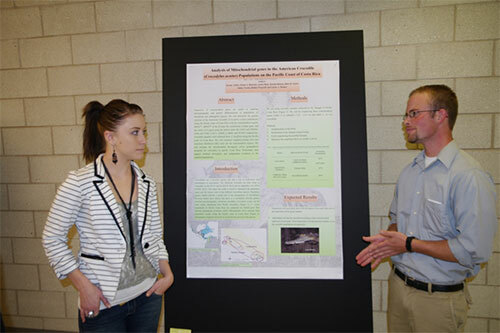 Southern Utah contains several fossiliferous formations and research is ongoing to use conditions in the geologic past as an analog for our modern world. F56D2.6 is a putative helicase of the “DEAH box” family that is required for the release of the lariat intron from the spliceosome. Although spliceosome function has been clearly elucidated in yeast, the C. elegans spliceosome is less well understood. Therefore, our research aimed to show that F56D2.6 was the functional homologue of the yeast PRP43 protein, in order to further our understanding of spliceosome function. We undertook several experiments, including an ATPase assay, a plasmid shuffle experiment, and we also looked for aberrant splicing in the F56D2.6 mutant worms. While the ATPase assay showed that F56D2.6 does have ATPase activity, the plasmid shuffle did not work. This may just mean that the F56D2.6 protein doesn’t function in yeast. We are continuing our aberrant splicing assays and will be conducting a miRNA analysis during the spring semester. We anticipate finding some interesting results that will lead us to answer even more questions concerning this research. I would like to present on the following test method that I developed. Over the past 3 years I have been developing a new test method Procedure D within ASTM (American Society of Testing and Materials) D2290. Current Procedures A, B, and C employ fixtures where split disk sections are installed in the ID of a pipe ring specimen that has been prepared with reduced or machined areas at the disk split. Tensile load is then applied to the split disks to simulate hoop stress in the wall of the pipe ring. However, as the split disks separate in tension, the ring segment test ligament straightens which applies a bending moment across the pipe wall. If the split disks fit loosely within the pipe ring, bending is increased. Wall bending compromises the hoop stress in the ring segment wall, and reduces the apparent tensile strength test result. 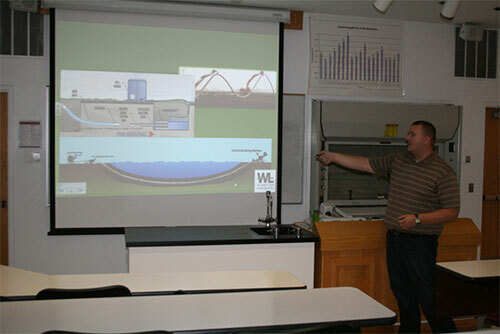 Procedure D employs a different fixture to apply a simulated hoop tensile stress to the pipe wall. For Procedure D, ring samples are cut from the pipe; then segments are cut from the ring sample, prepared with a reduced area and installed in the fixture. The fixture uses horizontal pins through the ring segment specimens to apply a simulated hoop tensile load to the pipe wall. When load is applied bending is greatly reduced compared to loose fitting split disks so test results are more consistent. Round robin testing was completed with seven labs participating. A laboratory experiment has been developed for the Materials Science and Engineering course that demonstrates one technique for measuring that diffusivity. It makes use of an online mass spectrometer to measure the concentration transient of hydrogen in sweep gas passing through a permeation tube. The coiled tube is housed in a chamber to which relatively fast thermal transients can be applied. By filling the chamber with a mixture of hydrogen and an inert gas such as nitrogen or argon at known concentration and then inducing a step change in temperature, the classical permeation transient for hydrogen through the tube can be observed. Combining these data with known pressures and flow rates allows for determination of the hydrogen diffusivity in the material of the tube. 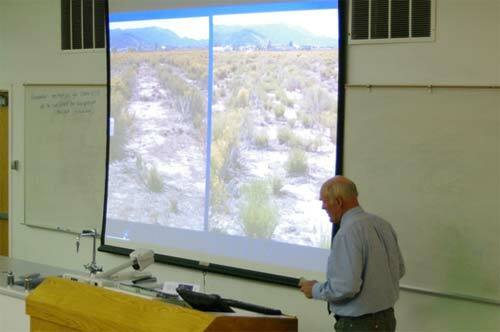 Working with the Mountain Ranch Resource Advisory Council (RAC) and the Utah Division of Forestry, Fire and State Lands the Range Management Program has developed a curricular project of monitoring the vegetative understory in the demonstration forest plots. This hands on learning opportunity is intended to be a multi-year project and will provide valuable management data. The program presented tonight will explain the project objectives and share the initial or base line data with the audience.